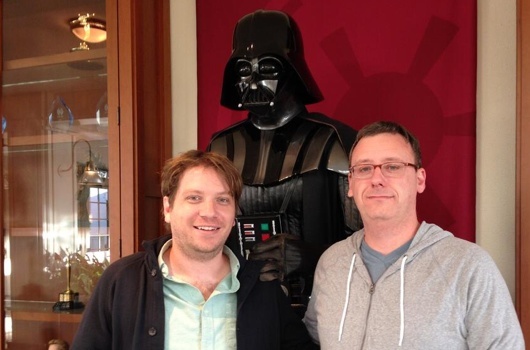 We still know very little about Star Wars: Episode VII – The Force Awakens. Fortunately we will get a little hint when the first trailer debuts at nine select theaters this Friday. Unlike the Star Wars we have seen in the past, these spinoffs provide a unique perspective on the Star Wars universe while still standing on their own. These spinoff films are scheduled to be released in between the primary numbered movies being directed by J.J. Abrams and Rian Johnson. The first to be released will be from Godzilla director Gareth Edwards and writer Gary Whitta. Since the beginning the plot to these movies have been shrouded in secrecy. But /Film has unveiled a rumor about the plot for the first spinoff. According to them, it will tie into obtaining important plans. Hit the jump for more. According to the site, the untitled 2016 Star Wars spinoff will center on a group of bounty hunters trying to steal the plans for the first Death Star. The film would be like Seven Samurai meets Ocean’s Eleven set in space. With the Galactic Empire ruling the galaxy with an iron fist, as the Rebel Alliance constantly on the run, it makes sense that the Rebels would hire bounty hunters to steal the plans. The bounty hunters do not align themselves with any faction, which would make them the perfect set of characters the film to focus on. Since there is something that is on the line for both parties, this will give the audience more of a reason to be engaged with the characters in the film. What /Film doesn’t know is whether or not Boba Fett will be in the film or not. Out of all the bounty hunters in the Star Wars mythology, he would have to be the face of the bounty hunters. But there are rumors that he could get his own solo film, so I’m not sure if it makes sense for him to be in this one. Again, this is just mere speculation. But if the rumors are true, and this is about bounty hunters, we would very well see bounty hunters like IG-88, Bossk, and Dengar in the film. Here’s where it starts to get a little hazy. The rumor also says that the Millennium Falcon will be involved, but that Han Solo won’t be in the film. How that works doesn’t quite make any sense. During the time of the theft we are led to believe that Han owned the ship. Based on the way he talks about it in A New Hope, it sounds like he has been flying the Falcon for quite some time. But if the rumors are true, it could be that Han Solo would steal the ship for his own at some point in the film, which would lead to his own spinoff. The final rumor says that the main character of the spinoff could be first introduced in The Force Awakens. This would mean the character would have to be very old, which would lead us to believe that it could be Max Von Sydow‘s character. That would mean we would have to see a younger version of Sydow’s character in the spinoff. But it could be that Sydow’s character doesn’t have a connection to the spinoff, but a new character that we have not seen or heard. Maybe it will be Andy Serkis’ character? We’ve seen plenty of characters live long lives thanks in part to the powers of the force or the kind of technology used to keep Darth Vader alive. But if it isn’t Sydow, Serkis fits the bill as he shown us time again that he can play any character at any age thanks in part to mo-cap technology. Naturally, Disney and Lucasfilm would not comment or confirm the rumors, but sources say that it is very possible that this could be the plot for the untitled 2016 Star Wars spinoff. There is plenty of speculation to go around now that this rumor has popped up. As mentioned, the plots to Star Wars: Episode VII – The Force Awakens and the spinoff films are being closely guarded, and there is a chance that things could change for the spinoff between now and principal photography. But let’s hope the rumors are true, as it will be a refreshing take on the ever-expanding Star Wars universe.